Huawei is preparing to announce its latest Mate lineup, complete with a Pro model that features a curved dual-edge display. Huawei is going to hold its launch even on November 3 in China and it has released a teaser poster on its official Weibo page. The poster reads “ A step ahead” but that doesn’t really explain anything. 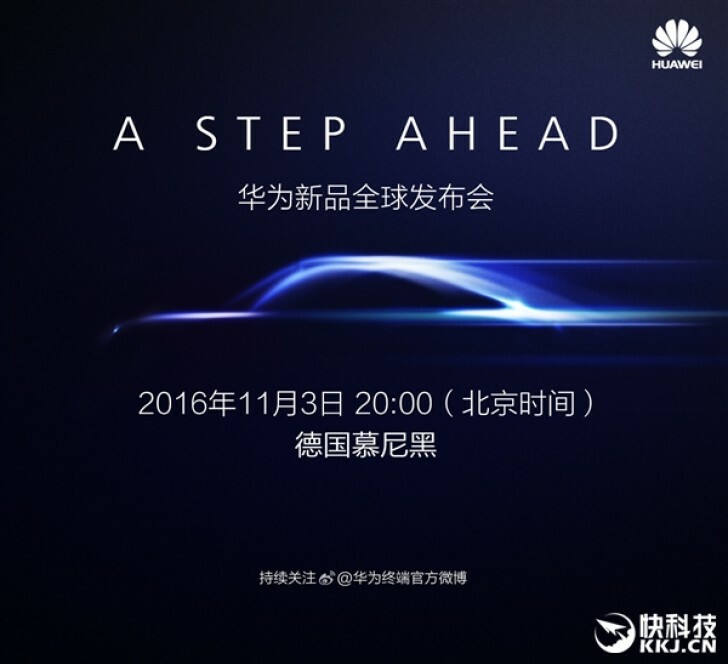 Also, Huawei throws us in for a loop with that car-silhouette taking up the center of the poster. We would hope that it is some indication of CPU speed (the Mate 9 is said to feature the company’s newest Kirin 960 CPU) or, perhaps, some new kind of integration with cars. In any case, the Huawei Mate 9 will feature a 5.9-inch 1080p screen, USB-C port interface, and said to come in two memory configurations with the higher one up to 6GB of RAM with up to 256GB of internal storage. There’s also a dual camera setup with 4X optical zoom. There’s also word of a Pro model, which is said to feature a dual-edged curved display, as well as an upgraded QHD screen. @evleaks also reports the tricked out Pro model could carry a retail price tag of about $1,300!